I love blue cheese. Admittedly, I love most cheeses- gooey, buttery, slightly funky double cream brie, tangy, soft, sort-of-pasty-consistency humboldt fog, nutty, firm aged gouda with the crunchy bits throughout, sharp, aged cheddar with a bite, I love it all. But I reserve a special place in my heart for blue cheese. I love its funky sharpness, it's creamy-yet-crumbly texture, and the earthy, cave-y undertones. I put it on a multitude of dishes. It's excellent on pasta salad, baked in blue cheese pull apart bread, it makes for a really tasty, interesting fondue. it was blue cheese, paired with balsamic vinegar and arugula that first made me enjoy salad. And of course, blue cheese dressing and buffalo wings is one of my all time favorite food combinations. The chicken wings are great and all, but the star of the show, for me, has always been the mixture of spicy, buttery buffalo sauce and creamy, funky, tangy blue cheese. Something about that melding of burn-your-tongue-off spicy and cool-cavelike-creamy-funky-cheesy flavors is incredibly addicting. But fried chicken wings, and more importantly, buttery buffalo sauce are pretty darn unhealthy. Especially when you eat thirty of them. So I wanted to make a snack that had that spicy-creamy-tangy flavor, that I could also eat huge amounts of without giving myself heart disease by the time I'm 30. 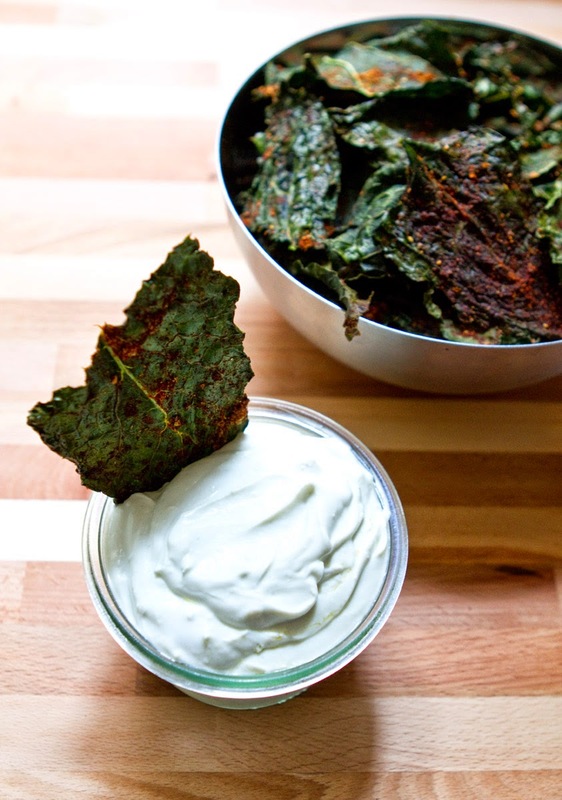 Thus, spicy kale chips with blue cheese yogurt dip. These are ridiculously good. They're very spicy, and using smoked paprika really adds a nice dark note. 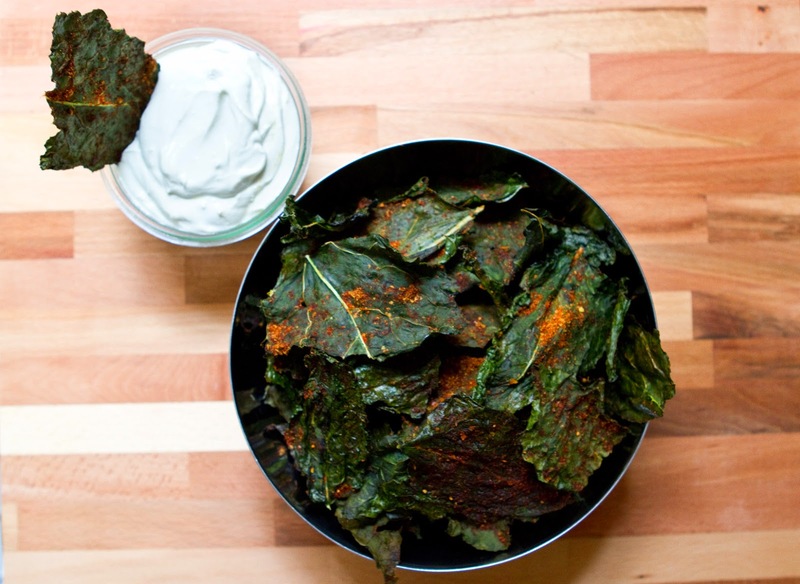 The baked kale is sufficiently crunchy, and the seasoning is salty and spicy enough to make these an addicting snack that becomes hard to stop crunching away at. And the blue cheese sauce is spectacular. I'll definitely be using this recipe the next time I make buffalo tofu. It's plenty creamy, and the tanginess of the yogurt brings out the blue cheese flavor wonderfully. 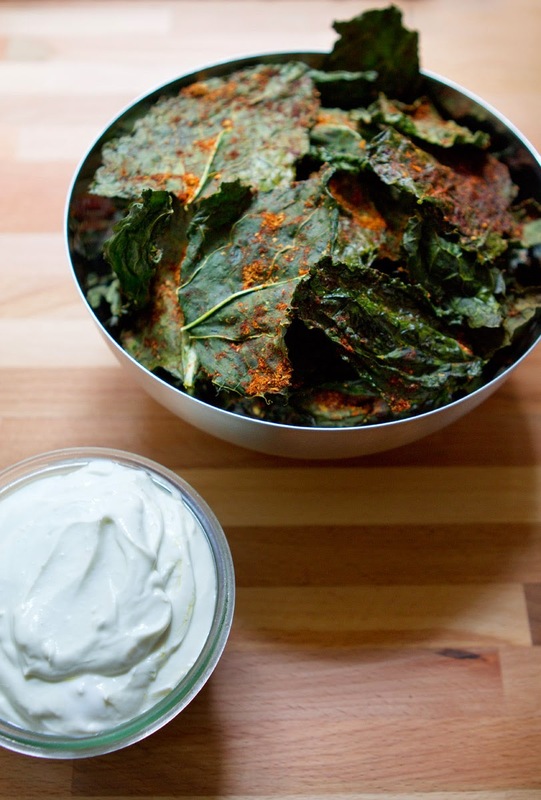 Feel free to use 0% fat yogurt to really make this a healthy treat, however I would avoid greek yogurt, as it's a bit too thick for the thin kale chips, regular yogurt is a better consistency for this dip. I would even use this sauce, perhaps a bit thinned out, as a salad dressing, if S didn't dislike blue cheese so much. It would be great slathered on arugula and cherry tomatoes. It would also be good tossed with bowtie pasta and fresh vegetables to make a pasta salad. I would put blue cheese on most things if S didn't dislike it, though. He's a lost cause. 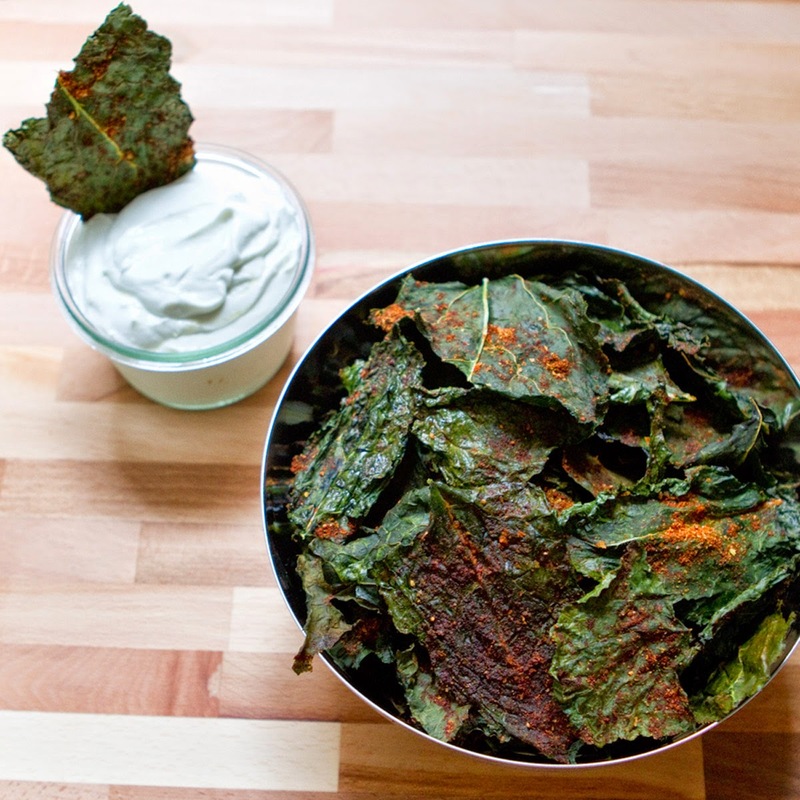 The pairing of the crunchy, spicy chips and cool, creamy dip is everything I want my snacks to be. I could eat bowl after bowl of these chips, and then finish the dip off with my fingers, but I'm not exactly classy when it comes to private snacking. These would probably be really great at a party, but honestly I just made them to eat while watching tv on the internet on a Thursday night, and they were magnificent. I hope you enjoy them, too. 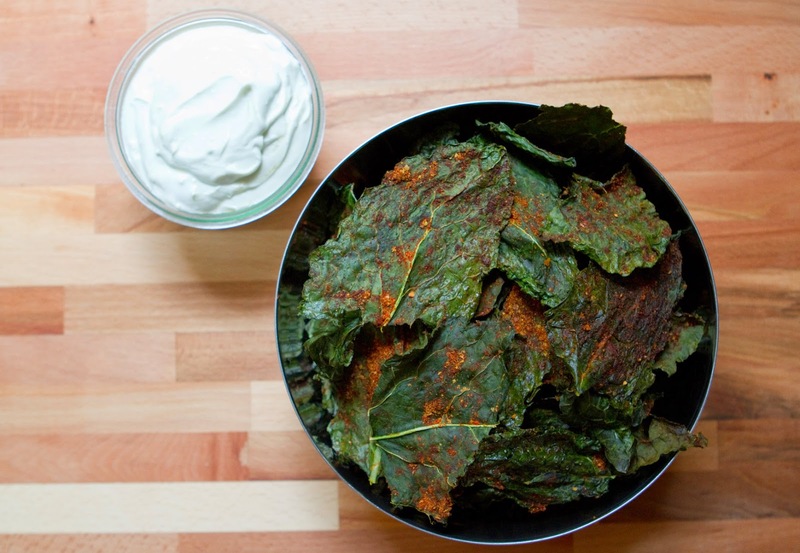 Wash and thoroughly dry the kale (a salad spinner works well), if the kale isn't totally dry your chips will not be crispy. Preheat oven to 300 degrees. Remove the thickest parts of the kale stems, and rip into 3" pieces. They'll shrink a bit in the oven, so rip slightly larger than typical tortilla or potato chips. In a small bowl combine salt, pepper, garlic powder, paprika, nutritional yeast, and cayenne, mix well. 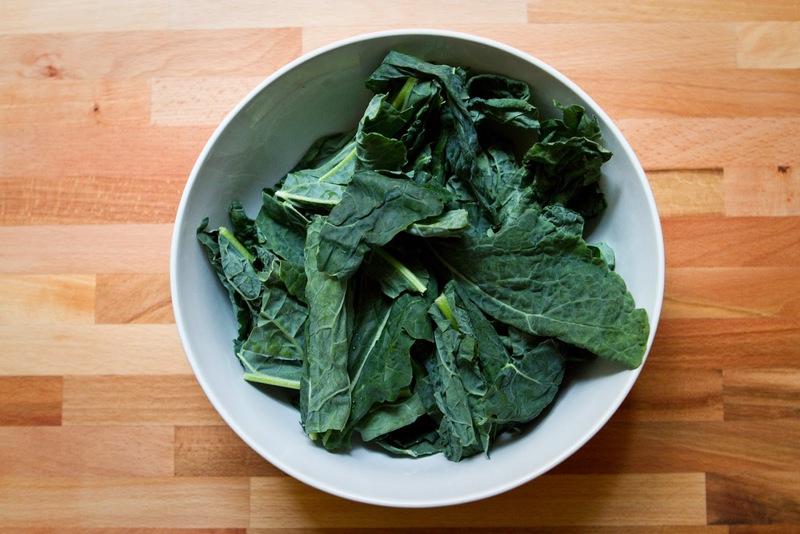 Place kale leaves in a big bowl and add the olive oil. Toss to thoroughly combine, then rub each leaf until it's well coated and the oil has been lightly massaged into the kale. 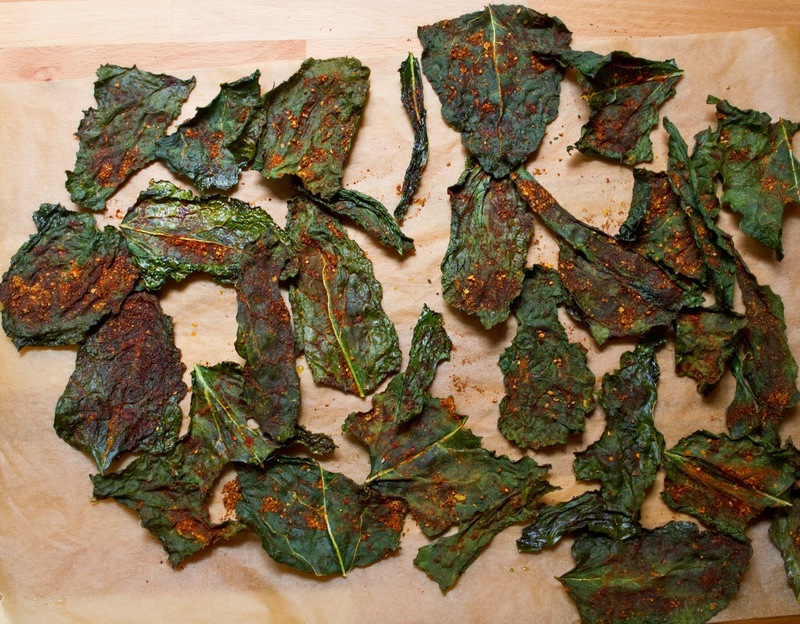 You want each leaf lightly coated, but not soaked, in oil. 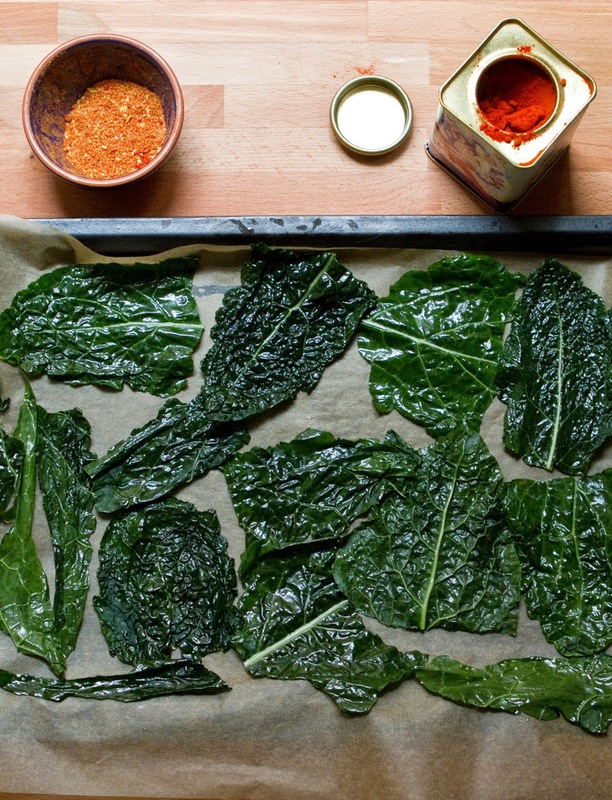 Arrange kale leaves on a parchment paper lined cookie sheet, in a single layer. The leaf edges can be touching, but overlapping will result in a loss of crispiness. You can cook two cookie sheets side by side at a time, if your oven size will allow it. Sprinkle arranged leaves liberally with the seasoning mixture. 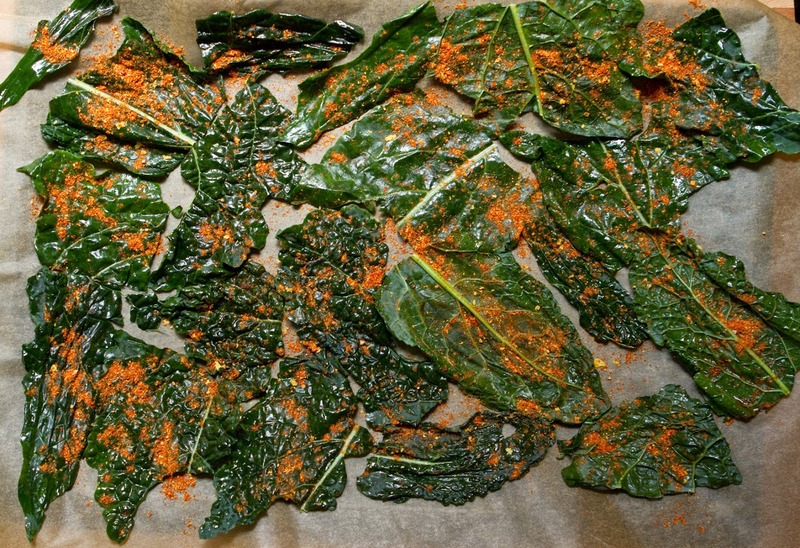 Bake for 8 minutes, then rotate pans, and bake another 8-10 minutes, or until the kale has become dry and crispy. More oily pieces of kale may retain some shine, but you want to make sure the leaves are totally crisp before removing from the oven. Allow to rest and cool on the pan for about 3 minutes before removing. 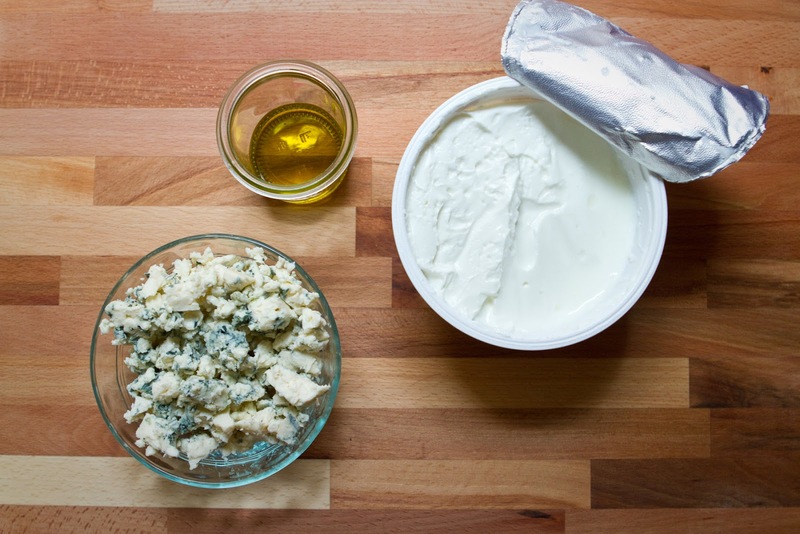 While chips bake, combine yogurt, blue cheese, olive oil, and worcestershire sauce in the bowl of a food processor. Blitz until thoroughly combined. Add milk, 1 tablespoon at a time, blitzing in between, until desired consistency is reached. 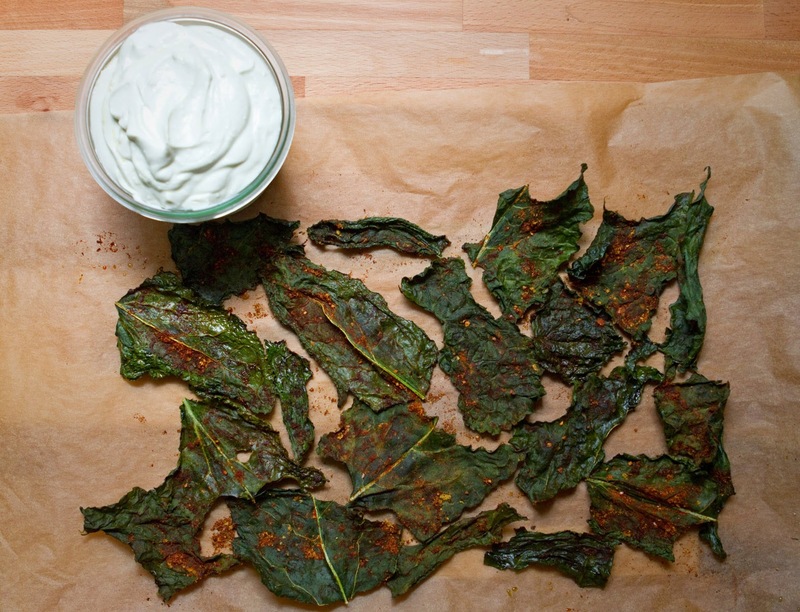 Dip should be slightly thinner than most chip dips, closer to a thick salad dressing consistency. Dip can be served cool, or at room temperature. Enjoy!